If you go through the financial numbers when filed with the SEC (note the results on Wednesday will be preliminary) and take what the company tells you on the quarterly call, it possible to build a model to predict the linearity and velocity of CSCO’s business. I have such a model and I will not share it on this blog. It culls a decade worth of performance data, management commentary, sell side notes, etc into viewpoint designed to predict how management will guide the business versus market expectations. This can be reproduced, especially if you have no life and like to spend many hours reading and calculating numbers on a spreadsheet. If I look at the model here is what it is telling me for Q3 which they report on Wednesday and Q4. On average the guidance for the next Q revenue is 51.47% of the backlog going into the Q. This number has had a low of 46.28% and a high of 59.20%. This number varies because management sees the forward looking sales funnel and can predict in quarter book to bill turns – but they do not report the funnel numbers. These unknown numbers will be in play Wednesday night. Going into Q3, I think CSCO started the Q with ~$4.094B backlog. Another metric is to look only at the product bookings as multiplier to the product guide by stripping out the services business. This multiplier typically overestimates the revenue guide because I have to tweak the model to handle deferred revenues better. I simply correct for it in the model. CSCO’s book to bill ratio (product only) has ranged from 0.91 (Q1 ’09) to 1.08 (Q4 ’09) in last 14 quarters. CSCO’s product revenues have never topped $9B in a Q. 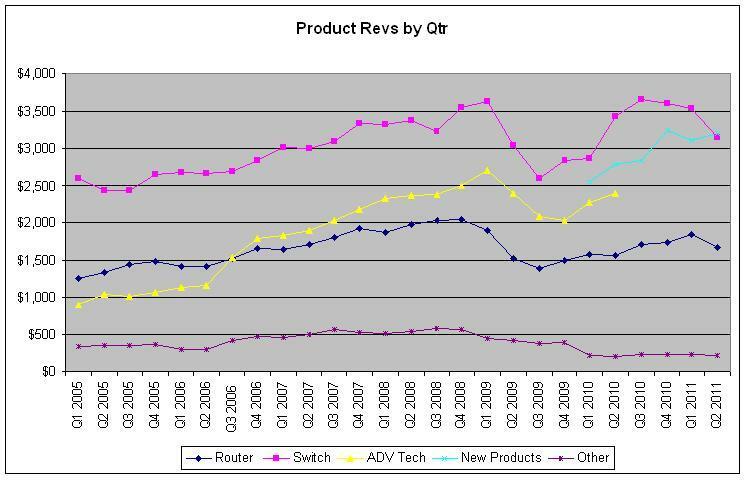 Only once (Q4 ’08, which was the Q before LEH blew up) has CSCO’s product bookings topped $9B. On their Q2 FY11 call, CSCO guided revenues to $10.9B for Q3 and $11.85B for Q4. I am using the mid-point of the guide for Q4. This revenue level is a tad aggressive. Assuming that the services business continues to grow by ~$100M a quarter, Cisco is expecting two big back to back bookings quarters or they have deferred revenues coming off the books they expect to recognize. In the past 14 quarters, CSCO has missed the revenue line once (Q4 FY10) by 28bps. That tells me they have an excellent near term ability to predict the follow-on quarter revenue. If the management team says they are going to print $10.9B for Q3 FY11 I believe them. 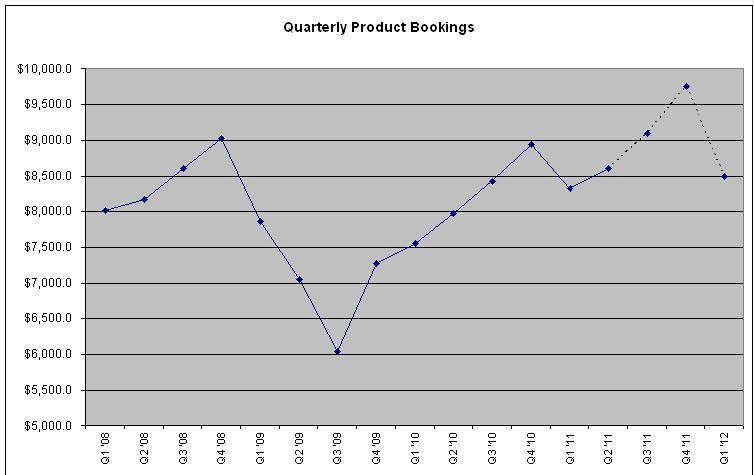 What is surprising about the $10.9B number is it implies a big bookings number in Q3. I estimate to get to this number the company needs $9.1B in product bookings followed by $9.75B in Q4, which is typically their best business quarter. I think it can be done, but we are assuming that in a quarter of organizational changes, mea culpa letters, soul searching that the company was able to be focused on the business. I am going to take them at the word on the Q3 revenue number; I just wonder what they had to do to get the numbers done? Will product margins suffer? The two most important forward looking numbers that management will provide for Q4 and Q1 FY12 will be (1) revenue and (2) margin trajectory. The stock will work or fail off these two metrics. If you are long CSCO, then you are making the assumption that management can run the business to achieve a high rate of customer wins, margins are stable and this implies that the economy is getting better. If you are bearish CSCO, you think they have negative product cycles in switching and routing, margins will suffer and the company is unlikely to grow a pace to move the stock. 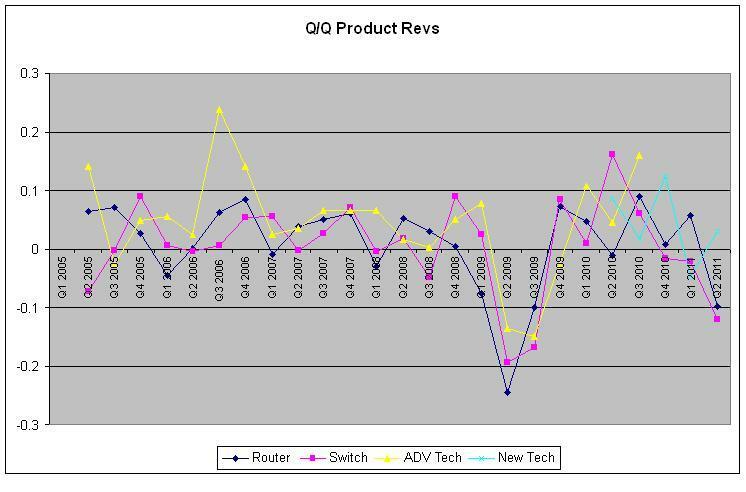 See the product revenue by quarter chart, the downtick in switching has been a big concern for investors. – Can the market specific competitors (e.g. APKT, RVBD, JNPR, ARUN, FFIV) continue the momentum against CSCO? – Will technology spending in general see a positive or negative inflection going forward? – Has CSCO stopped the negative product cycles (e.g. switching) and momentum? If the forward guidance is soft and the product segment data looks poor, I would say this further proves in the theory that focused competitors are hurting CSCO and this is good for FFIV, APKT, RVBD, JNPR and ARUN. Reaffirming or increasing revenue projections would imply that the US and maybe the global economies are getting stronger and that caution should be considered on being long the CSCO competitors. The argument can be made that a rising tide lifts all boats, but some consideration of competitors eating CSCO’s lunch in specific markets must be considered and whether CSCO has decided to defend and take market share. Margins will be an indicator. Net/net…I wait to hear what management has to say before I make my choices. Any lower guidance on revenues or poor margin guidance would be bad for the stock. That would mean that you want to be long the CSCO competitors and that the management team needs to go back into the Telepresence chamber and figure it out.